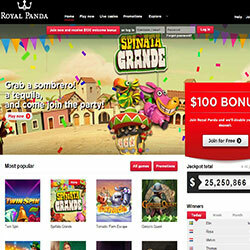 Royal Panda Casino is a great, customer-oriented online casino site which offers huge variety of gaming content. The casino’s games are developed by popular and beloved software provider companies such as Net Entertainment (NetEnt), Microgaming and Evolution. These names guarantee the amazing experience transmitted through Royal Panda Casino games. They have exciting and innovative gaming products, but the more conservative casino enthusiasts can also spend their time joyfully due to the wide range of table offers. Players can try out classic games like roulette, blackjack or poker with the new live casino system which helps to experience a completely realistic casino adventure. There are also a lot of blackjack games to choose from on the amazing site. Blackjack Party, Live Blackjack, Double Exposure Blackjack and Blackjack Professional Series are just a few of the titles featured under the blackjack section. All of these games guarantee to make the players fully immersed into the unique world of the 21 game. Unfortunately US citizens can not gain access to the popular online destination, but they balance it by offering their amazing services on mobile devices (Android and iOS devices). There is also an effective customer service, whose employees are ready to help you Monday to Friday, from 9:00 am till 00:30 pm (CEST) in case you have any problems. Royal Panda Casino‘s popular games are developed by industry leader Net Entertainment who are famous for producing top-quality gaming softwares. In addition, the popular online casino is also in partnership with Microgaming and Evolution, which are also well-known companies in the software development market. These 3 gaming providers are crucial in Royal Panda Casino’s success as they are the creators of all the thrilling games offered by the prominent website. Players can try out 6 different kinds of blackjacks at Royal Panda Casino. Live Blackjack, Blackjack Professional Series, Blackjack Party, Blackjack Classic, Double Exposure Blackjack and Single Deck Blackjack Professional Series are available at the online casino. All of these games offer great challenge and excitement for all kinds of table game enthusiasts. 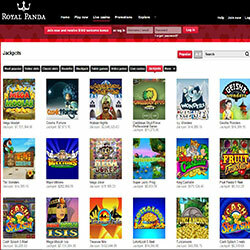 Royal Panda Casino offers great variety of games. Casino enthusiasts can find games that aim to transmit the traditional casino experience with games such as blackjack, roulette, or different table games. For the more innovative players, the online casino provides video poker in different themes. The customers can also find popular video slots such as Twin Spin, Gonzo’s Quest or Lucky Leprechaun. In addition, if a player would like to connect gambling to movies, it is also an available option at Royal Panda Casino with various movie-themes video slots and games. For example there are video slot games themed after popular series like Game of Thrones slot or South Park slot.There are also reel titles inspired by the classic movies like Scarface and Terminator. Royal Panda Casino offers a great $210 Blackjack Bonus on the 21st of each month. Furthermore, players can take advantage of the weekly 50% Bamboo Bonus up to €150. 18+, first deposit only. Terms and Conditions Apply. Casino bonus: min. £10, max. £100. Bonus/freespins winnings wagering requirement: x35. Max. bonus bet: £5, can vary. Free sports bet: Minimum deposit and stake £20 (min odds 2.0). Credited after all qualifying bets settled. To sum up, Royal Panda Casino is a great destination for online gamblers due to its wide range of gaming content. Everyone can find the game they like as there are innovative video slots, classical table games but there is also an online casino. In addition, their mobile casino is improving pretty well which is another plus point for them. The only bad side is that US players are not given access to the site, but other than that it is just positive. Royal Panda Casino offers great live dealer experience. With its different games in the live casino, customers can enjoy the view of beautiful dealer girls while playing live blackjack, live roulette or live baccarat among many others. Royal Panda Casino has a great number of games available for mobile devices, enabling casino enthusiasts to have a nice time anywhere they go. Android and iPhones are also accepted but players can also experience the joys of gambling at the mobile casino by using their iPads or Samsung Galaxy tablet, among many other devices. 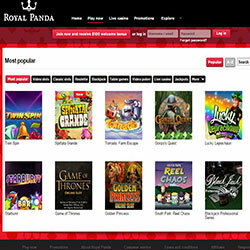 There are more than 70 games available for mobile devices at Royal Panda Mobile Casino. For example customers can win great prizes at the popular Twin Spin slot or Lucky Leprechaun slot by using their phones. They can also play live table games such as blackjack, roulette or baccarat and those are just a few of the list!